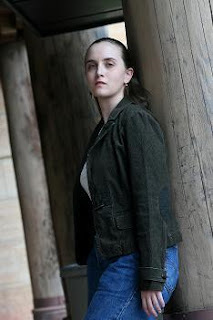 Please welcome Marie Brennan to The Qwillery. Within the Sanctuary of Wings, the 5th and final Memoir of Lady Trent, was published on April 25, 2017 by Tor Books. TQ: Welcome back to The Qwillery! 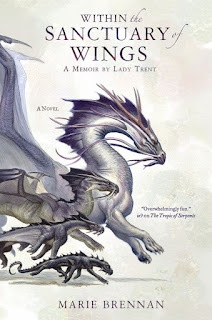 The first of the Memoirs of Lady Trent, A Natural History of Dragons, was published in 2013 and now Within the Sanctuary of Wings, the final Memoir has been published. What are your thoughts on ending this series? Marie: I'm sad to see it end -- but I also am glad to be finishing while I am sad, rather than after I've grown tired of it. Or worse, after my readers have grown tired of it. TQ: When we first spoke I asked if you were a plotter or pantser and you replied "...somewhere in between." And now, 4 years later, how would you answer that question? Has anything changed about your writing process? Marie: I'm a bit less linear than I used to be, but ultimately, I'm still in between on the question of outlining versus improvising. For example, I knew going into Sanctuary what Isabella was going to find, but the specifics of how she found it and what happened afterward? Those mostly got made up as I went along. I still have fixed points I want to hit, and those get added to along the way, but a lot of it is still discovery, me figuring out how I'm going to get from where I am to where I want to be. TQ: You are both an anthropologist and a folklorist. 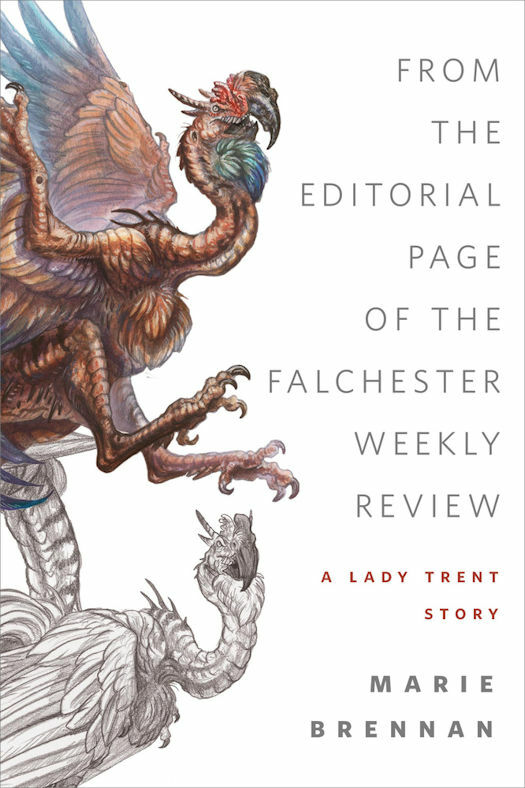 Have you based any of the dragons that have been documented by Lady Trent on anything in the fossil record? Marie: Oh, definitely! The drakeflies in The Tropic of Serpents were inspired by a dinosaur called Microraptor, which had two sets of wings. They were probably connected by a membrane rather than being separate like a dragonfly's, but that didn't stop me from running with my own version. And the idea that a swamp-wyrm at different stages in its life cycle might look like very different organisms also came from a theory about certain dinosaurs -- apparently I was reading a lot about dinos while I worked on that book! TQ: And do you have a favorite dragon from folklore? 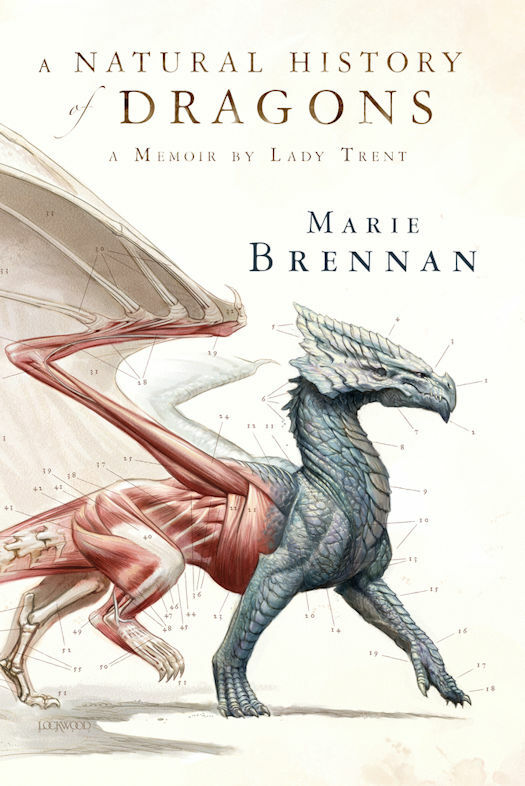 TQ: What is the most unusual thing that Lady Trent has discovered in Books 1 - 4? Marie: I am so tempted to name off some random detail about people! Part of the idea behind the series is that the places she travels to are every bit as interesting as the dragons she studies there. But since I suspect you meant something dragon-related, I'll say the odd quirk of draconic development Isabella figures out at the end of In the Labyrinth of Drakes, via the honeyseeker breeding project. I can't really be more specific without spoilers, though. TQ: Please describe Within the Sanctuary of Wings in 140 characters. Marie: Intrepid lady adventurer nearly gets killed in the Himalaya discovering awesome dragon stuff! TQ: Please tell us something about Within the Sanctuary of Wings that is not found in the book description. Marie: There's a whole lot of linguistic fun around the efforts to decipher the ancient Draconean language. 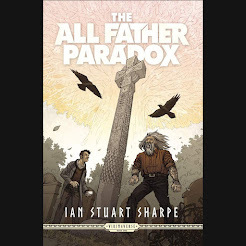 And I love the fact that fans of this series are the kinds of nerds who really will find that fun -- it's like a puzzle, and the characters have to get really creative to solve it. TQ: Give us one or two of your favorite non-spoilery quotes from Within the Sanctuary of Wings. Marie: "In the history of scientific discovery, it is my opinion that insufficient credit has been given to the behaviour of the humble yak." 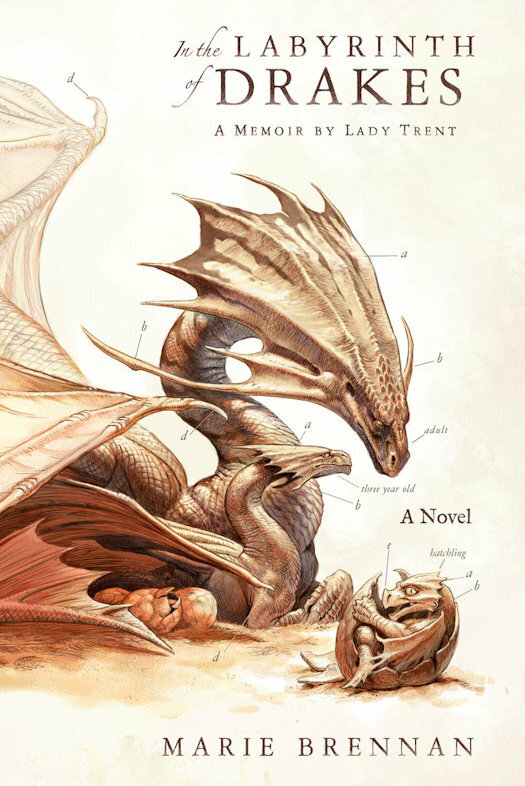 TQ: Please tell us a bit about the 4 dragons on the gorgeous cover of Within the Sanctuary of Wings? Marie: Todd Lockwood and I were discussing the covers a year or two ago, trying to figure out what else we could do that would fit the "scientific" theme of the images, without being a rehash of what we'd done before. He was the one who suggested an evolutionary series, like those pictures you see of a chimpanzee getting bigger and more upright until it's a modern human being. The idea is that you're seeing how a much more lizard-like creature eventually became a beautiful Yelangese azure dragon. TQ: Who has been your favorite not main character in the Memoirs? And which character has given you the most trouble? Marie: Oh, man -- you're going to make me pick? I'm going to cheat and say my favorite is a tie between Tom and Suhail. The former because I loved developing his partnership with Isabella over the course of the series, and the latter because he's an archaeologist and in some ways my self-insert character. Most trouble was Ankumata, the ruler of Bayembe, because he required me to think through a lot of political calculus to figure out how he should act. Marie: On May 30th Tor.com will be publishing Lightning in the Blood, the sequel to Cold-Forged Flame. 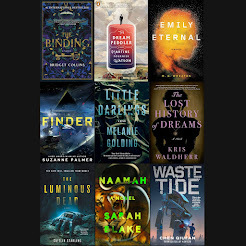 That series is more in the epic fantasy vein than the historical/scientific flavor of the Memoirs, but I've had a lot of fun with the worldbuilding for it. After nearly five decades (and, indeed, the same number of volumes), one might think they were well-acquainted with the Lady Isabella Trent--dragon naturalist, scandalous explorer, and perhaps as infamous for her company and feats of daring as she is famous for her discoveries and additions to the scientific field. And yet--after her initial adventure in the mountains of Vystrana, and her exploits in the depths of war-torn Eriga, to the high seas aboard The Basilisk, and then to the inhospitable deserts of Akhia--the Lady Trent has captivated hearts along with fierce minds. This concluding volume will finally reveal the truths behind her most notorious adventure--scaling the tallest peak in the world, buried behind the territory of Scirland's enemies--and what she discovered there, within the Sanctuary of Wings. 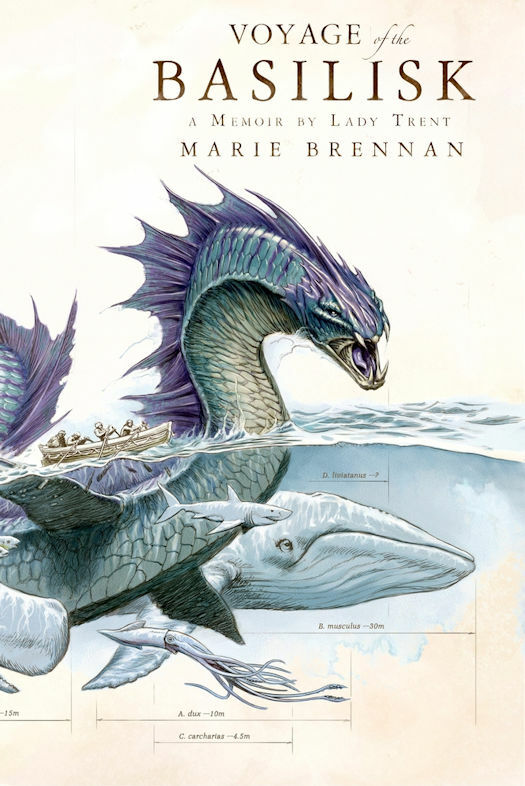 In the Labyrinth of Drakes, the thrilling new book in the acclaimed fantasy series from Marie Brennan, the glamorous Lady Trent takes her adventurous explorations to the deserts of Akhia. Even those who take no interest in the field of dragon naturalism have heard of Lady Trent's expedition to the inhospitable deserts of Akhia. 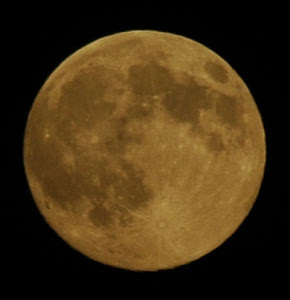 Her discoveries there are the stuff of romantic legend, catapulting her from scholarly obscurity to worldwide fame. The details of her personal life during that time are hardly less private, having provided fodder for gossips in several countries. As is so often the case in the career of this illustrious woman, the public story is far from complete. 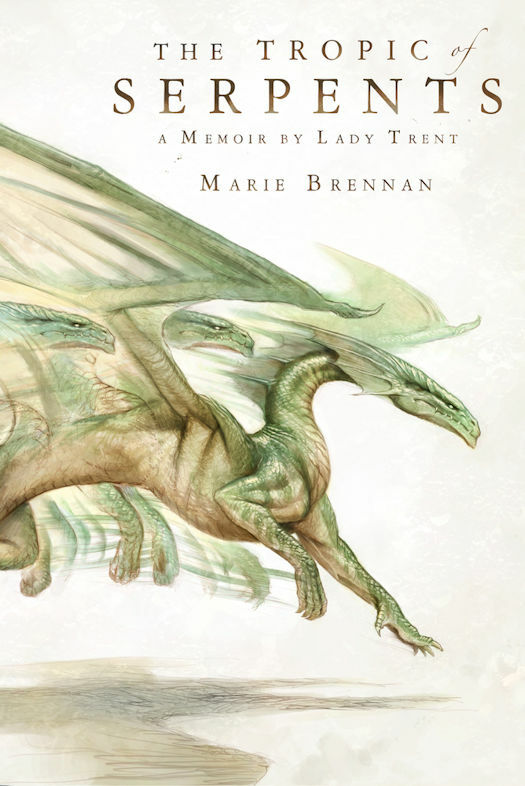 In this, the fourth volume of her memoirs, Lady Trent relates how she acquired her position with the Royal Scirling Army; how foreign saboteurs imperiled both her work and her well-being; and how her determined pursuit of knowledge took her into the deepest reaches of the Labyrinth of Drakes, where the chance action of a dragon set the stage for her greatest achievement yet. After risking the neck of her loved ones and herself during her perilous sea voyage aboard The Basilisk, and the discoveries made at Keonga, Isabella, Lady Trent, returns to Scirland with the aim of publishing her research. And yet, given the level of secret knowledge she now posses, she is reduced to waiting to reveal her new academic discovery until royal decrees can be lifted and a fraught political situation avoided. In her idle frustration, Isabella vents her spleen upon the shoddy research published by lesser men with swollen heads in local journals. Enjoy the following collection of letters, found in a trunk of mislaid scholarly documents left behind when she removed to Linshire for the season.